During excavation work by the French Institute for Oriental Studies (IFAO) at Tabetl Algish in the south Saqqara necropolis, two very-well preserved tombs were uncovered. The tombs belong to two priests from the reign of the sixth dynasty King Pepi II, and include their skeletons and a few items of their funerary collection. The first priest is named Ankhti and the second is Saby. 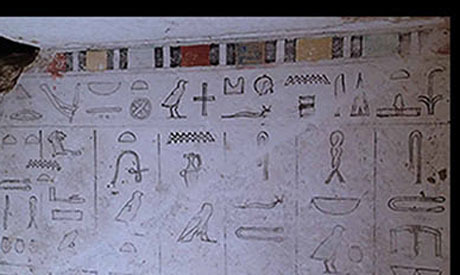 Minister of Antiquities Mamdouh Eldamaty explains that the walls of both tombs are very well decorated with paintings depicting religious rituals, among them presenting offerings to deities. He asserted that the paintings are still bearing their vivid colours as if they were painted yesterday, although they were dug 4,200 years ago. “These paintings are a good documentary revealing the type of religious rituals at that time as well as showing the skill of ancient Egyptian artisans,” Eldamaty confirmed. French Egyptologist Vassil Dobrev, head of the mission, explains that burial shafts are found at a very deep level inside the tombs. Saby’s burial shaft was six metres deep, while the one of Ankhti was found 12 metres deep. He went on to say that each tomb is built on two levels: the upper one is on the ground built of mud bricks, while the lower part is a rock hewn of limestone. Kamal Wahid, director of the central administration of Giza antiquities, told Ahram Online that although a few alabaster vessels, offerings and the skeletons of both priests were found, both tombs were subjected to looting in antiquity. Both skeletons were found scattered on the ground and not inside sarcophagi. 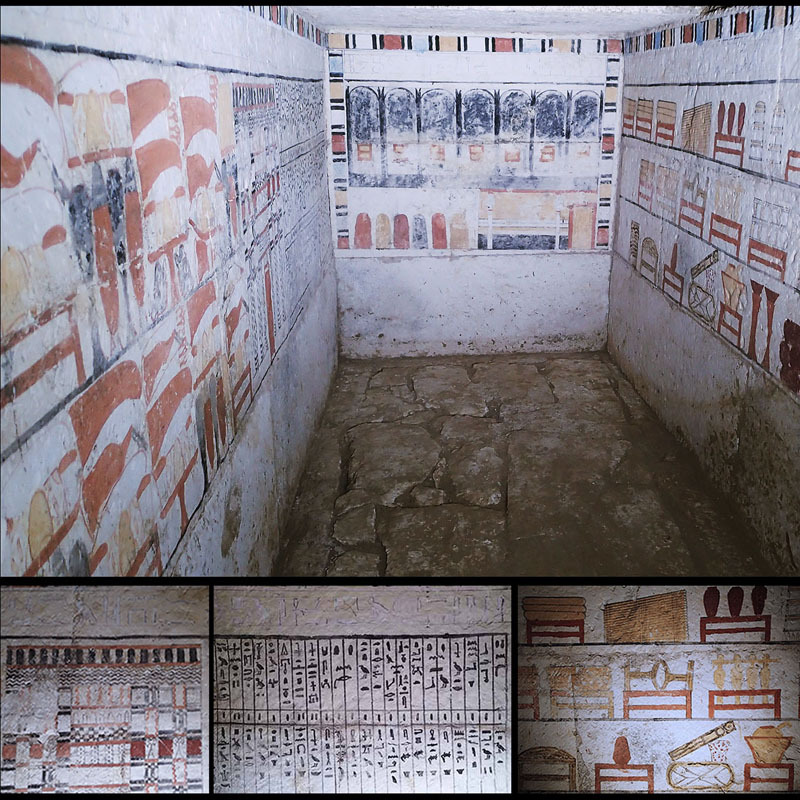 He explains that both tombs are almost identical and bear very distinguished scenes, among them the ancient Egyptian offerings painted on the walls of the priests’ burial chambers. It shows the pot of the seven ritual oils and the list of offerings with their names and quantities. Incense balls and copper burning incense are also depicted as well as head rests and necklaces worn by priests. 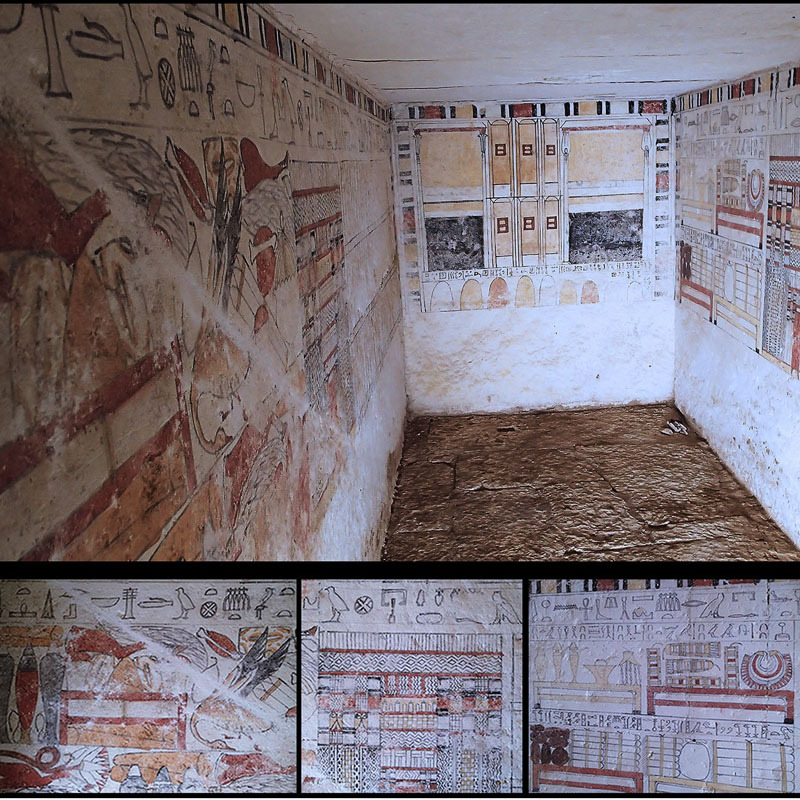 I understand other tombs also had vivid paintings that faded quickly when the tombs were opened. Will you be able to save these? The ENDLESS EXCITEMENT of the daily new discoveries of the GREAT ANCIENT CIVILIZATION of our country makes us proud to be an EGYPTIAN!